No need for luck with this kind of great work! Very good research. schliesse mich dem vorredner an. bei so schicken sachen hab ich da auch keine bedenken ;) viel erfolg noch in der heissen schlussphase. 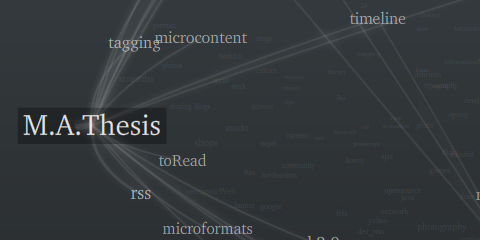 I would really like to have a way to incorporate your tag cloud onto my website. One question only? How can we get the tag map cloud for our own website? We own several portals and this will be a great idea to link everything. I’ve been visiting this page every few months for the past couple of years to see if we’ll ever get to use this. Please put a price tag on it and get it out into the world, there are a lot of people who’ll help you spread/extend it. Nice ! I’d love to put my own delicious url in an imput box ..?